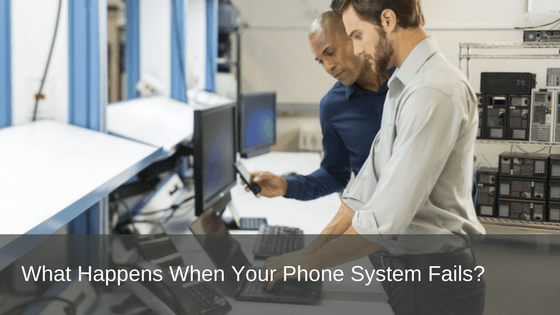 What Happens When Your Phone System Fails? Here are some troubleshooting ideas you should know in the event your business VoIP plans and phone systems experience any interruption. SIP trunk plans are not bulletproof, however, there are a few things you can do to protect your business phone system if a major issue should occur. Power outages, loss of internet connection, battery failure. These are all manageable scenarios if you plan ahead of time. Here are some of the top troubleshoot guides for SIP phone and business VoIP plans. Where applicable, we have included a few tips on how you can plan ahead. If you are using an Analogue Telephone Adapter (ATA), this issue could occur if the ATA is unable to register with your VoIP provider. If the problem was caused from a loss of internet connection, start with cycling the modem and router/IAD. If this does not fix the issue, call your internet service provider. If you have voicemail set up on your business VoIP account, your service provider can route any incoming calls to the voicemail whilst the issue is being rectified. Some business VoIP service providers also offer the feature of call forwarding on the loss on registration. In the event of any loss of internet connection, your incoming calls are automatically forwarded to a pre-set number. This is a feature worth considering for the sake of fielding any potential missed calls while your service is down. Check for a light corresponding with the issue on your business phone system. If the light is illuminated try connecting the phone to directly to the IAD without using any devices or splitters between the IAD and the phone itself. You can also try changing phone cords and/or the phone. If you don’t have a light on the VoIP business phone system, try rebooting the IAD. Poor business VoIP call quality is usually generated by inadequate bandwidth. It may also be caused from internet congestion which slows down the connection. To source where the bandwidth is being used, investigate whether your PC is running an application that you may not be aware of. Run a security scan to check for malware on the back-end of your computer. Check for any packet loss on your connection. If you find this as an on-going problem ask your internet service provider to check your connection. If you are using more than expected, investigate your options for a higher level of service with more bandwidth. Some SIP trunk plans and business VoIP plans and offer more compressed codec, or bandwidth server settings. This could also be worth looking further into if you are experiencing call quality problems. Firstly, try turning the phone volume down to prevent acoustic feedback. If the volume does not help, check your options for separate caller ID’s or splitters as they could be the culprit for causing near end echo. Buzzing is usually an electrical-related result of analogue interference into the phone line or the phone itself. electrical voltage added into the lines to set up an alarm system, separate caller ID, etc. Ensure you have the correct power supply required to run your business VoIP system. Try connecting a phone directly to the IAD to see if that will eliminate any buzzing noise. Check the batteries and charge status in cordless devices. You could also check the quality of an alternate channel on the phone to see if it improves. Keep spare handset batteries on site in the case of any cordless device battery faults. We can’t control the unexpected, but with a little diligence and know-how you can arm your business with arrangements that will cause limited disruption should your phone system fail. Prosum SIP trunk phone plans and call rates incorporate convenient call management features like Disaster Recovery. In the event of an emergency, Disaster Recovery can divert all calls to an alternative line or call plan, quickly and easily. For more information or help contact us today for expert advice – call 1800 007 229 or visit www.prosum.com.au. Our team can failsafe your business VoIP phone system so you don’t need to worry about the unexpected.